Patricia Caracappa is a Spanish Teacher at Howitt Middle School in Farmingdale. 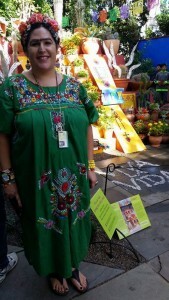 I am a teacher certified in both Art and Spanish who visited the FRIDA KAHLO: Art, Garden, Life exhibition on three separate occasions. As I experienced the show in three different ways during a five month period, both with my students and on my own, each visit left me speechless. Here I hope to give voice to my special experiences at the Garden. My students at Howitt Middle School first experienced the rich offerings of Children’s Education programs related to the exhibition when FRIDA KAHLO opened in May. 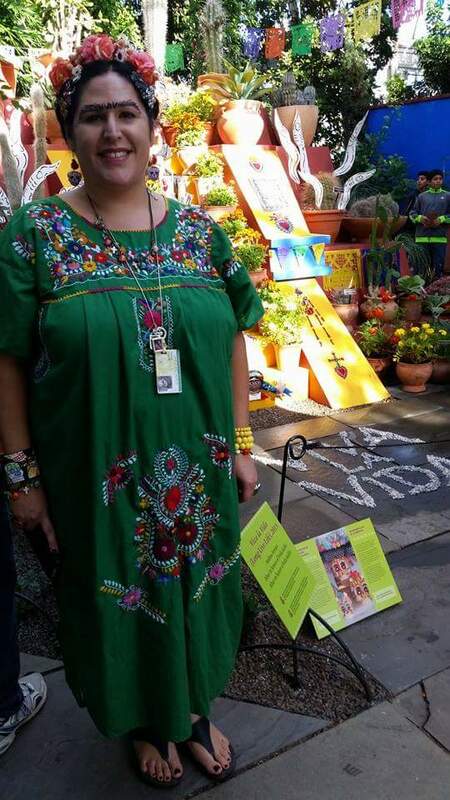 During the Poetry for Every Season: Mexican Poetry Walk offered by the GreenSchool, my 7th grade Spanish students were challenged to find the connections between the lives of two significant contemporary Mexican artists: the painter Frida Kahlo and the poet Octavio Paz. Examining the thematic images in Kahlo’s artwork and comparing them to the written themes they identified in Paz’ poetry—in Spanish, too!—my students discovered for themselves the significance of the specific choices artists make to communicate ideas they care deeply about both visually and linguistically. This facilitated program revealed seamlessly the artists’ close observation and symbolic uses of plants, their Mexican nationalism, and their deep appreciation for the natural world. From the first day of FRIDA KAHLO: Art, Garden, Life, we have been awestruck by the stellar Frida-inspired looks displayed by our visitors. 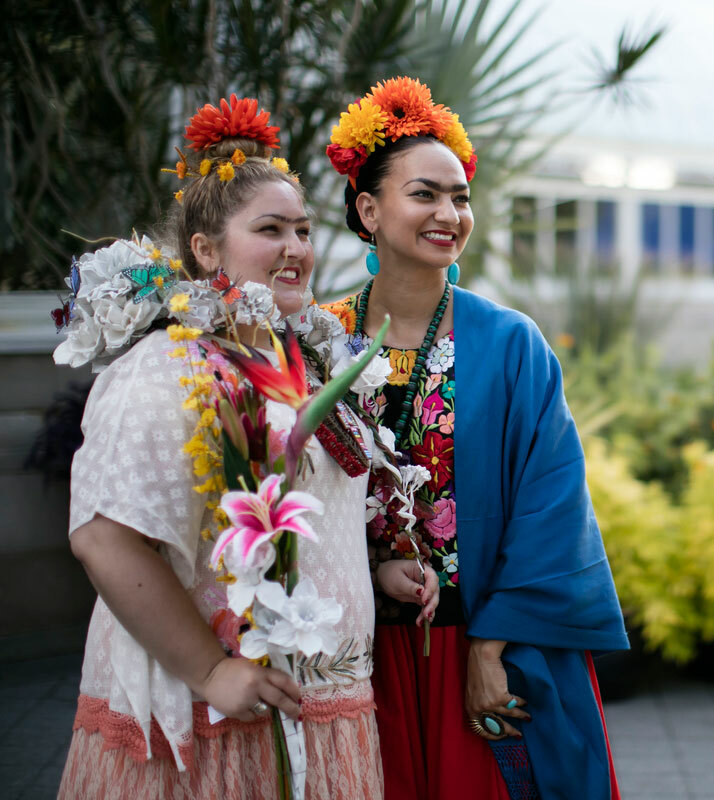 Kahlo aficionados of all ages and from all over have flocked to the Garden in flower crowns, colorful shawls, and long skirts, entering the reimagined Casa Azul in the Haupt Conservatory while evoking the iconic artist. Without any prompting, many of the record number of visitors to see this show have put in impressive effort to make this a singular and heartwarming moment in the Garden’s nearly 125-year history. To reward the enthusiasm of the art- and garden-lovers attending this exhibition, NYBG has held a series of Frida Look-Alike Contests during select evening events throughout the six-month run of FRIDA KAHLO: Art, Garden, Life. Thursday, October 22, is your last chance to participate in—or simply admire—these joyous and festive evenings of creative display. Register today for a chance to show off your best Frida and win a gift bag from NYBG Shop. 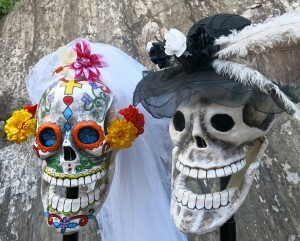 An Honorable Mention will go out to whomever best incorporates an homage to Día de los Muertos in their outfit. Fall brings fresh air, vibrant color, and seasonal activities for the whole family at NYBG this year as part of the final month of FRIDA KAHLO: Art, Garden, Life. Come celebrate the season and experience this blockbuster exhibition before it closes on November 1 with Frida al Fresco Evenings, Día de los Muertos Weekends, and Halloween activities for the whole family—including the annual Giant Pumpkin Display! 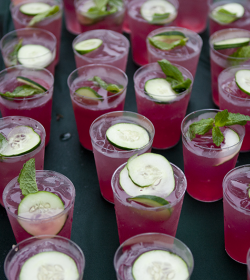 Only five Frida al Fresco evenings remain during the last month of FRIDA KAHLO. Be transported to the world of Frida Kahlo’s Mexico City during a crisp fall evening at NYBG for an unforgettable escape. On select Thursday and Friday evenings in October, the Garden remains open until 11 p.m. with live music, cocktails, and more to enhance your experience of the Casa Azul in the Conservatory and Kahlo’s rare works in the Art Gallery. Este Fin de Semana: FRIDA KAHLO Opening Weekend Celebration! This weekend you’re invited to join NYBG for the Opening Weekend Celebration of FRIDA KAHLO: Art, Garden, Life! Enter Frida’s world with live music, family activities, film screenings, and delicious dining options—all during the height of the Garden’s seasonal spring beauty. The Azalea Garden is at peak color, with the herbaceous peonies displaying their own vibrant hues. 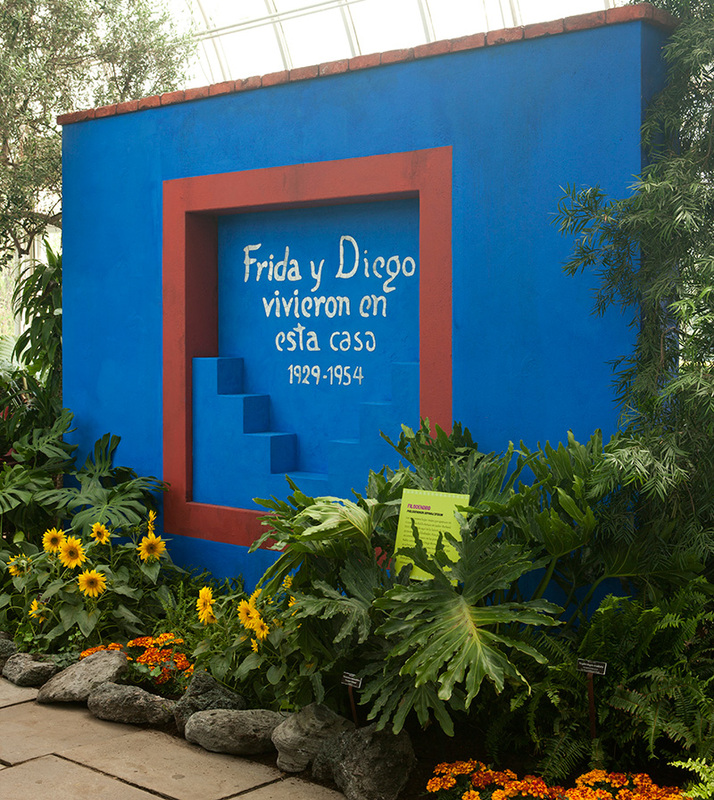 So spend this weekend at the Garden, and enhance your experience with our new mobile guide (must be on mobile) for FRIDA KAHLO, created with the support of Bloomberg Philanthropies. So read on for the complete schedule of special programs, events, and tours this weekend! Evening events at the Garden provide one of the most magical atmospheres in New York City, and make for a perfect way to view our world-class exhibitions. FRIDA KAHLO: Art, Garden, Life will be no exception. When the exhibition opens to the public on May 16, that evening will mark the first occasion in the grandest season of evening events the Garden has ever presented. Frida al Fresco Evenings will take place on select Thursdays, Fridays, and Saturdays throughout the exhibition’s six-month run, with a variety of featured musicians, dancers, performers, and artists each night to transport visitors to Coyoacán and beyond. Explore FRIDA KAHLO: Art, Garden, Life on Your Smartphone! We’re counting down the days to the Opening Weekend Celebration of NYBG’s blockbuster summer exhibition, FRIDA KAHLO: Art, Garden, Life. The Garden is abuzz with busy preparation that will extend across the grounds, from an exhibition of more than a dozen original works by Frida Kahlo in the Art Gallery of the LuEsther T. Mertz Library, to a beautiful evocation of Kahlo’s famed garden and studio, the Casa Azul, in the Enid A. Haupt Conservatory. In fact, there are 10 main components to this grand and immersive exhibition across the Garden! 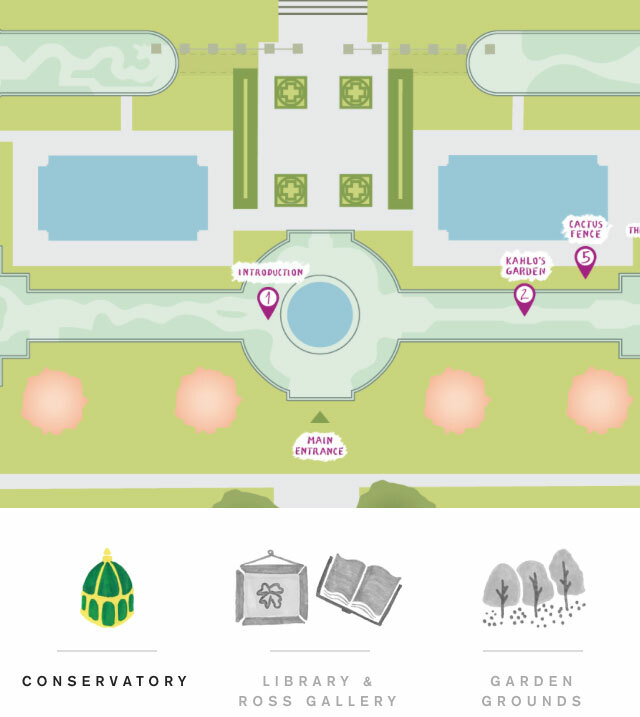 So, with funding from Bloomberg Philanthropies, NYBG has developed a mobile guide for smartphones that will take you through the entire experience, either on-site or before you visit! Read on for how this digital companion will help you navigate the exhibition, learn more about the artist’s life and times, and create your own customizable Frida selfies to share!